Whoever looks at a painting, a sculpture, or at architecture, without requiring an ever-present scientific and technical knowledge, puts in place a mechanism of voluntary and conscious contemplation; in opposition, the auditory perception itself is passive, always open but not always aware of its openness. The comparison between two independent areas, art and sound, is the subject of the exhibition “Art or Sound” curated by Germano Celant and presented at the Fondazione Prada in the two a fresco floors of the Ca ‘Corner della Regina in Venice, until November 3rd 2014. The exhibition path, characterized by an historical method, is developed through a checkerboard setting with paving and exhibition’s stands made with sound-absorbing material. It suggests the visual similarities between the exhibits, silent artifacts and not, in a general climate of cacophonic perception, that makes the contemplative and acoustic fruition of efficiency difficult. The dominant impression is that of an encyclopedic desire, that is configured through the display of a collection of extraordinary objects, in the spirit of Wunderkammer, to reiterate a museum setting, farther and farther away from the idea of the White Cube. 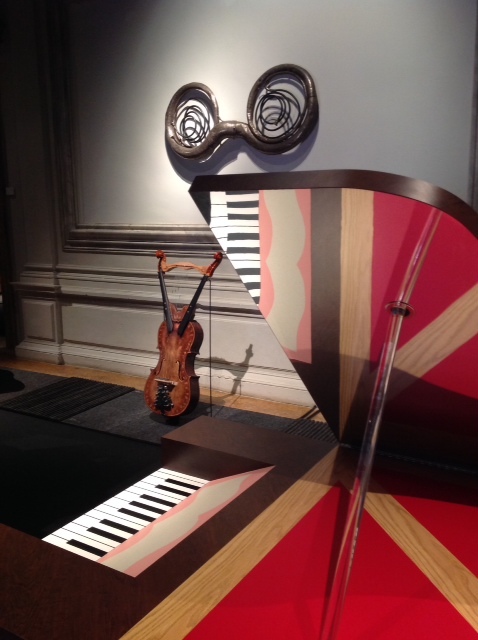 There are, guitars and violins, inlaid marble of the seventeenth century, the eighteenth-century musical automata, clocks of nineteenth-century Swiss invoice, the historical avant-garde (in the exhibition the “Clac Clac” by Giacomo Balla, 1914, and Man Ray’s metronome); anchor, the trumpets of the Last Judgment by Pistoletto, the Fluxus movement, the assemblies of Claes Oldenburg and Jean Tinguely and the derelict orchestra by Robert Rauchemberg (Oracle, 1962-65). 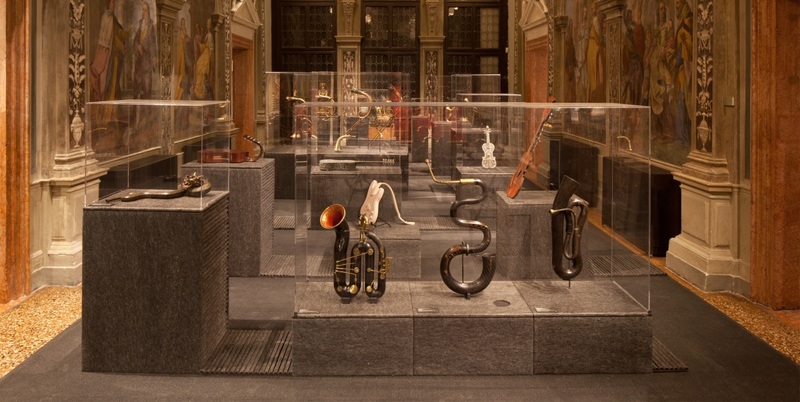 The research relationship linking art to the instrument sound seems to be directed towards the appropriation of the iconic and formal object, or the performance of its component-building mechanics. There are also cases where creativity goes hand in hand with technological innovation, as is for the curious optofonico plan created by the Russian musician, painter and sculptor Vladimir Baranov-Rossiné: the object is a mechanical instrument made from painting discs, prisms, lenses, mirrors, born in 1912 with the idea of creating “lighting” concerts. Art and sound come together in a cheerful moment of aesthetic participation, by the viewer, in the works performing that in themselves involve the interaction of the same, from the “phone booth” by Laurie Anderson (Handphone Table) to the table-xylophone Doug Aitken (Sonic Marble Table). In seeking to question the centrality of the gaze, through the perception of sensory multilingual receptions, brings in result, quite the contrary a dynamic, if often repetitive, pounding until compulsiveness. Perhaps to replicate the aesthetic stimuli can make us cross the threshold of indifference? It does not appear that the purpose of the exhibition aims to investigate “the issue of the relation between art and sound”. “An issue” Celant affirms “that runs through the artistic life from the seventeenth century to the present day as an aspiration to theme a space or a sensory territory that is not complying with the Western tradition and its schematic coordinates. Mark the path of modernity and sinestetica relationship between different expressive languages of communication in order to find another order that is not conventional”. 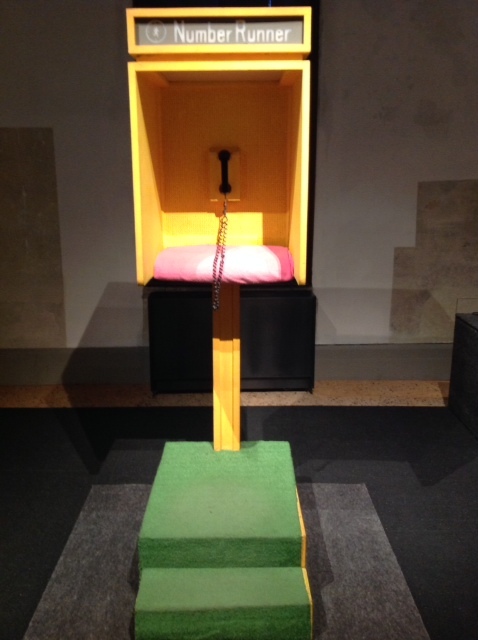 The tight coexistence and the de-contextualization of the objects in the exhibition, representatives of a broad tissue, so chronologically and historically relevant, rather than suggesting a new order, contribute to a general aesthetic and critical leveling, so that the initial brilliance, mixed with awe and wonder, declines at the end of the show in full baroque.